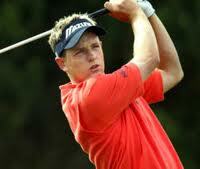 Luke Donald of England clinched the PGA Championship and the number one world golf ranking after defeating compatriot Lee Westwood in a play off. On the first playoff hole, Donald landed his approach onto the No. 18 green to within a few feet, while Westwood sent his shot into the adjacent water hazard to decide the tournament at Wentworth. It is only the second stroke-play title in the past five years for Donald, who joins Westwood and Nick Faldo as the only Englishmen to hold the top spot since the rankings were introduced in 1986. Donald will replace Westwood when the new rankings are released on Monday. Donald had missed the opportunity to dislodge Westwood in the no.1 spot when he lost in the final of the World Matchplay Championship. Donald had missed two previous chances to become No. 1, losing to Ian Poulter in the World Match Play final last week in Spain and going down to Brandt Snedeker in a playoff at The Heritage in April. But his consistency in finishing in the top 10 for the past nine tournaments, including winning the Accenture Match Play event in Arizona in February, ensured his first playoff victory on either the European or US Tour will give him the No. 1 ranking.